Qwaya is a powerful and affordable tool to optimize your Facebook and Instagram Marketing. 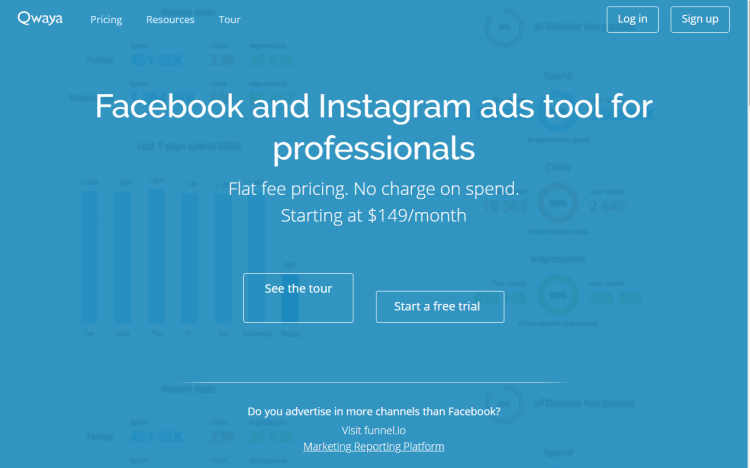 Qwaya is a Facebook and Instagram ads management tool for professionals. It is a great tool for managing your Facebook ads if you are planning to run A/B tests and has a power-editor like interface which makes it easy to get started with. It offers a lot of functionality and comes with seamless integration with Google Analytics for more inclusive and exact data insights. Ad scheduler – Ad campaigns can be set up to run at a specific time of day and/or week through smart scheduling. Ad and campaign rules – Well-defined performance-based rules to pause your campaigns.